On the first day of the school year my sister-in-law, Hilda, who works as a lunch monitor at an elementary school, gets unusual packages from some of the kids: they give her little bags filled with tabs from soda cans that they’ve collected over the summer. When she has a boxful, she delivers them to the Mount Sinai Hospital in Montreal who sells them to a recycler. The money they receive goes to support the hospital. It’s a cause Hilda has been promoting for the past ten years. The children at the school and the teachers love the idea of helping out someone in need. Our entire family regularly snaps off the little tabs before dropping the empty soda can into a recycling bin. I decided to follow her on a recent delivery and find out more about the program. 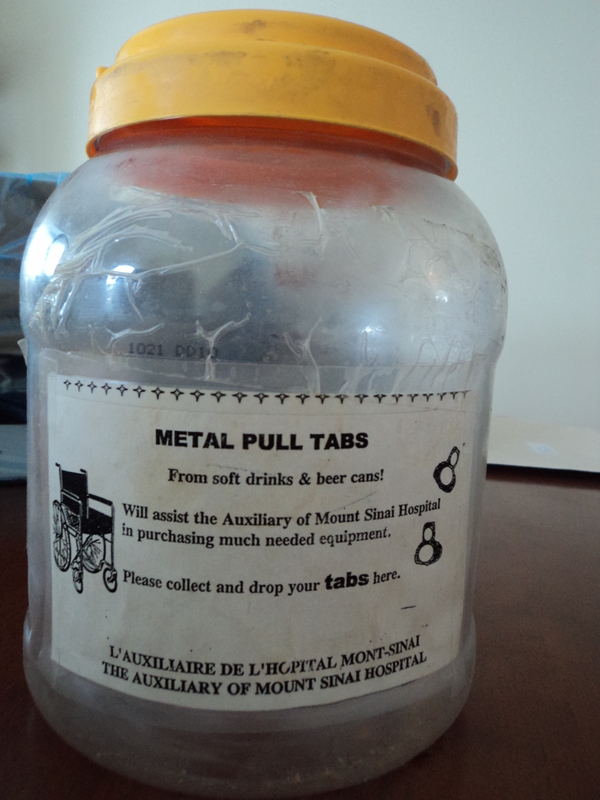 The Auxiliary of the Mount Sinai Hospital runs the Can-tab program. 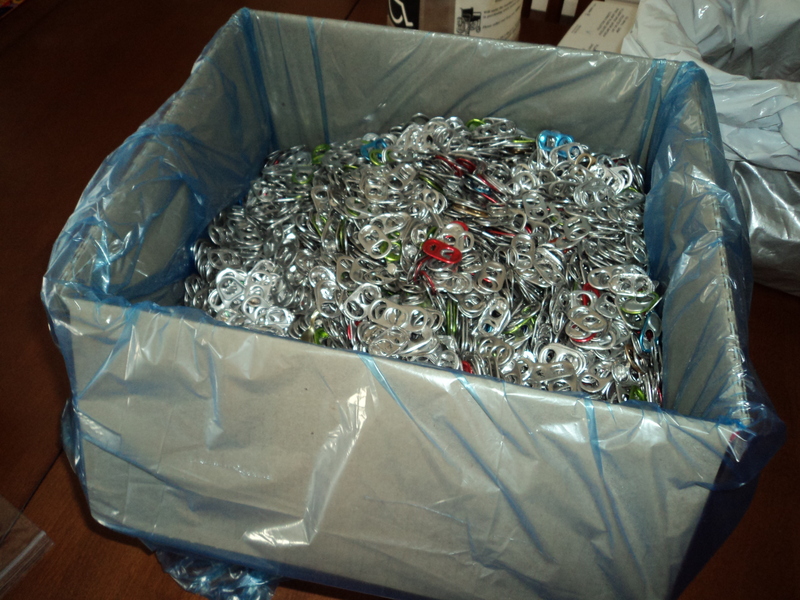 Lorraine Caplan, Co-president of the Auxiliary, explained that they receive bags of can-tabs from as far away as Florida. Every few months, several huge bags are sent to a recycler who pays them $500 to $600. Only tabs from soda cans are accepted as they are pure aluminium. When Hilda first started collecting can tabs, the money went towards buying wheelchairs. Now, the money is used to support music and art therapy at the hospital. The Auxiliary took on the responsibility of paying the therapists’ salaries ever since government cutbacks took effect. This entry was posted in Montreal and Community, People and tagged Canada, charities, fund raising, Montreal, Mount Sinai Hospital, recycling. Bookmark the permalink. Reblogged this on Common Ground Fundraising. I think I’m also going to ask my co-workers to save the tabs. It’s such a simple way to help the hospital raise money.